So it was my first client overseas! The groom was from China and the bride was from India, they now live in Kuwait and the wedding would be in Italy! I was the lucky one! Talk about a fabulous client who has great charisma! It made working with him so much fun! That's right I did say him. Typically I am dealing with the bride but in this case, my contact was the groom, Alex. I had only one previous experience with a groom which was Kedar, my Ganesh invitation and that turned out to be enlightening and a lot of fun! Alex was just as good! He's an excellent communicator and quite organized in his thoughts. He would provide recaps of our conversation with tentative timelines in emails following our conversation (loved this!) Though many details had not been decided on regarding the wedding, he was calm and collected, not like my typical bride who is starting to panic or stress out with all the last minute things left to do. I think men handle the stress of a wedding differently than we as women do. I am in awe with that since I also was that panicking bride as my wedding date approached. 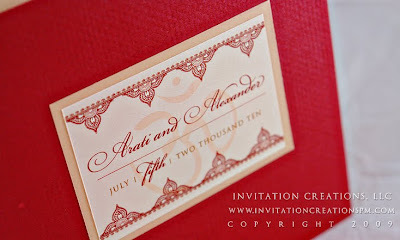 Last year, Alex found me via my blog, the Ganesha invitation. 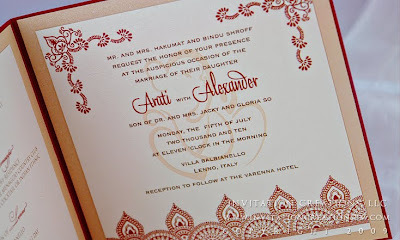 After reading this entry and admiring the invitation, He contacted me to do his engagement invitations. 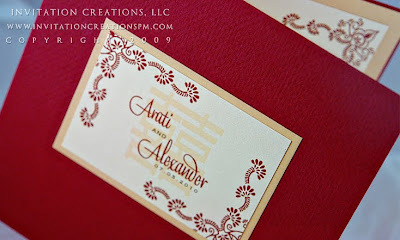 I've had so many inquiries regarding that blog that I'll be sharing some photos of the sample invitations I designed that were not chosen so you can see some more of my work of Indian/Chinese invitations. Typically I don't share samples not chosen, but in this case, with it being so unique I can't hold back!!! 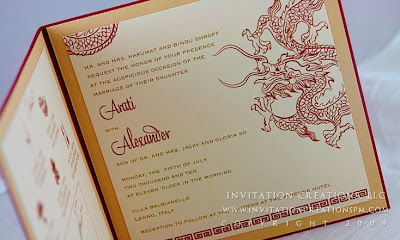 Alex loved the elegance of the Ganesha invitation! Looking at a computer screen, he couldn't tell about the paper quality, though. I assured him he would be pleased. Once he received the engagement invitations, he called me to let me know how happy he was with the final product. Yay! 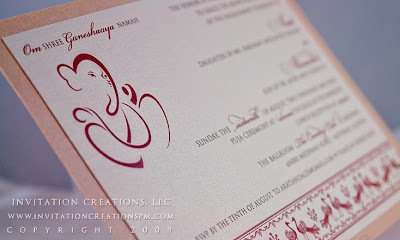 He was still enamored with the Ganesh invitation but was teetering on the idea of having something different, either a new Indian design, a Chinese design or the mixture of the two. These alternate designs are the ones I will share with you. After selecting on booklet layout, I went to work on creating a couple of new designs based on our conversations and some inspirational pics he had sent me. 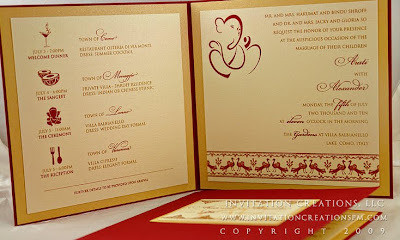 In the end, he loved the original Ganesh design best and the design and wording was altered to fit the square booklet. Colors were something he was open to as long as there was no offensive color to either of their cultures. After a couple of suggestions regarding colors, I did suggest keeping to the same color palette as the original and Alex agreed. Being a destination wedding (in Italy-I've always wanted to go there and I'm sure it was just a stunning event!) he had a good grasp of the RSVP's and decided against a traditional response card. We alternatively provided an itinerary of events for the guests. Since it was a three day event, it worked out well. 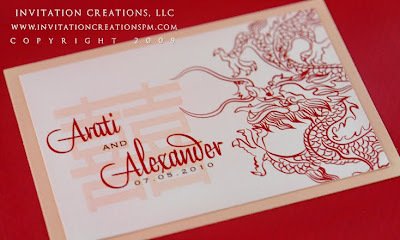 I want to thank you Alex for the honor of working on these invitations for such a special event. I look forward to working with you again in the future!!! The invitations are excellent and lovely. The designs are very good! Thanks for this information!